Where is the Fish under Water? © 2018, Fu-Kwun Hwang; Fremont Teng; lookang. Selecting an option in the combo box will display their respective functions. 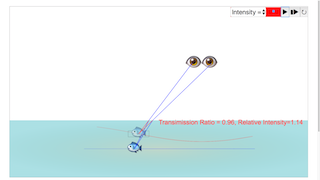 After dragging the fish, the image and line of sight will adjust accordingly. Note that the fish will start moving after releasing the drag. The eyes too can be dragged to different positions. Double click anywhere on the screen to toggle full screen.